Spring Season is a very exciting time of the year especially for pond owners. Plants will begin to blossom, fish become more lively and birds as well as other wildlife will begin dropping by again to enjoy your beautiful water feature. It’s important to start the warm season off on the right foot. A quality Spring Clean-out can keep your ecosystem pond looking health and great for the upcoming summer months. A good place to start before cleaning is figuring out how deep of a cleaning your feature needs. Their are a few things you can look out to help you figure this out. 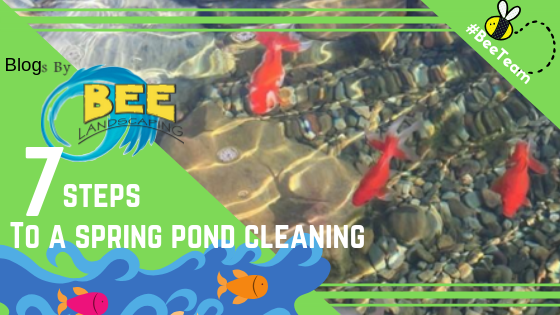 When you look and see a thick layer of "crud" or debris sitting on the bottom of your pond and you have a darker colored water it is probably a good idea to have a full pond clean-out. If you have fish, use some of this pond water to fill up the holding tub. Your fish can be removed from the pond using a net once the water is low enough so you can easily catch them. Be sure not to keep the fish in the holding tub for more than several hours. Keep them in a shady spot with a net over the top of the pool to prevent them from jumping out. 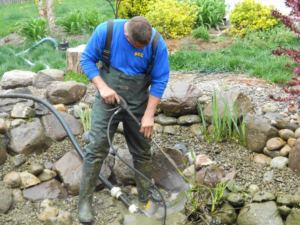 ​Rinse the inside of the pond by using the pressure washer to remove debris from the rocks and gravel. Do not scrub all of the algae away. Some algae on the rocks are beneficial in developing a strong ecosystem. Use the gentle stream provided from a garden hose to rinse the rocks and gravel. You should start from the top and work your way down to the bottom. Periodically turn the clean-out pump on to remove the dirty water. You can stop the periodic pumping once the water rinsing down starts to look clear. Take the pump out and begin filling the pond. If you’re on city water, it’s suggested to add Pond Detoxifier to the water so it is safe for your fish. You can dip a five-gallon bucket in the holding tub and fill it with water. After catching your fish place them in the bucket and set the bucket in the clean water pond water. After about 15 minutes periodically begin splashing some pond water into the bucket. By now, the temperature of the pond and the bucket water should be close to the same. Once it is you are ready to spill the fish into their newly cleaned home. You are done! It's tough work but getting your pond off to the right start this spring will allow you to fully enjoy the pond lifestyle that much more these warm months. Best time for spring cleaning? Typically the best time to do your clean-out is early spring. This is right before the pond is fully woken from it's winter dormancy. Its ideal to perform the clean-out before the water temperature in the pond gets above 55 Degrees. This is because if your clean-out is done at warmer temperatures bacteria colonies will form and the ecosystem balance will again be thrown off putting your pond through a "green phase" making it look just as the name implies. Fabulous job done by Bee ponds. Our pond was in dire need of cleaning and they not only did a magnificent job of cleaning the pond but got the water features working and looking fabulous. The price was VERY reasonable and they were there when they said and couldn’t be happier I found them.